Well I just realized it was January when I posted last wow! I thought it was March. My winter was pretty lack of crafting. I had to put my long time furry friend down Christmas week and I really lost my mojo until spring. I just worked and moved through the motions. It was a busy spring and summer. I started crafting again and started scrapbooking again using project life. Way easy and lots of fun. I joined Studio Calico monthly card making kits which I really enjoy. I have posted tons on instagram and have written countless post in my head just nothing real on my blog. A few weeks ago I was asked if I was going to blog again and I said yes. So here I am today! Enjoying a sunny September Sunday. 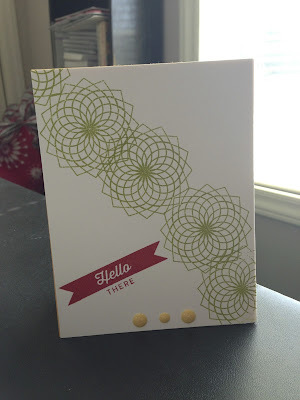 Today I am sharing I card I made with my new Studio Calico card kit. It was simple and fast. Very simple layout. 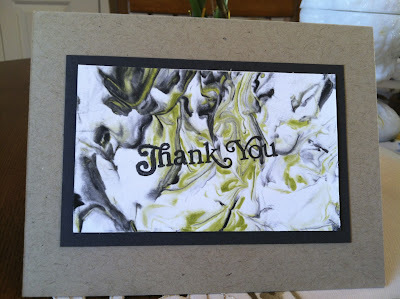 Stamped the image with PTI new leaf in across the card, then the sentiment in PTI pure poppy. Added the dots and called it done. Love the look and hope you do too! Thanks for stopping by! Have a wonderful week! I will be back later in the week! As I sit in my living room this Friday afternoon I am thankful for a great job that let us out early on a yucky weather day. 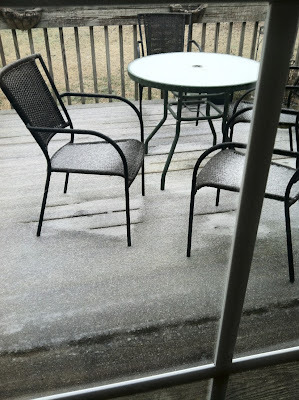 (below is a picture of my deck a few hours ago) About 10 this am the snow started and since it was so cold it stuck fast then it turned to freezing rain and sleet. I left work sometime after 12 and arrived home about 2pm. Mind you I am only 33 miles away from my job!! It is usually a 40-45 minute drive. In some area I drove 20 miles an hour! Plus I was so worried in my new car! I so did not want an accident in it!! Now hours later it is worse. My deck is covered with ice and slush. The birds even have ice on them! I am sitting enjoying having an afternoon off even if I really cannot go anywhere. I was going to my craft room but the house is so cold I am snuggling under a blanket on my couch! I am sure some of you are laughing at the small amount on my deck! But realize I live in NC and we have no idea how to handle this! Well I do but I am one of the few! Ok now on to my card!!! I am sharing my last thank you card for the holiday season! This was really easy to put together! I cut one inch strips of DP and put it on a strip of black with red twine, then last stamped with a sentiment. I really love how fast this came together! Well I am off to enjoy the rest of my evening snuggled under my blankets! Have a great weekend! Thanks for stopping by!! Happy Sunday! I am so happy that there is only one weekend left of Jan! It means one more month closer to warmer weather! The days are already longer! I really do not like dark days! I hope everyone is fairing well with their weather. We will be cold again this week, but not to cold! Last week we were suppose to get snow but when I woke up Friday there was nothing and I was so happy!! Here is another Thank You that I made for my Christmas gifts. I used paper I made over the summer when PTI had there stamp camp. I really love how easy it was to make! The card came together fast with craft card stock as the base the the home made paper is fixed to a black swatch. 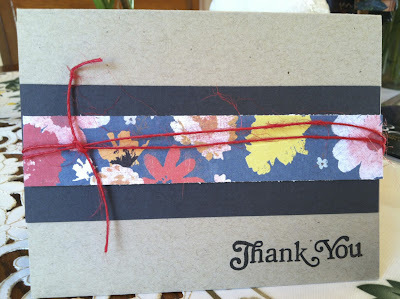 I stamped the Thank you sentiment in the center with black. I really like the way it came out. Well I am off to watch the AFC Championship game GO PAT'S!!! Have a great week!! Greetings! I hope everyone is well! I can not believe I have not blogged since November! December was a blur. It was busy, long and one I hope never to repeat again! I had some wonderful moments, but some really tough ones too. So I am so glad for the New Year and new month! I am still trying to figure out how it is the 13th of Jan. already! The weeks just fly by!! I don't know about you all but our weather is crazy! For the last two days we have been in the 70's! Oh my I had my windows open yesterday and today. I love when I can air the house out in the middle of winter. I have spent a little time in my craft room but really have not spent that much time. Since the football season is coming to an end I have a feeling I will be spending more time in there! 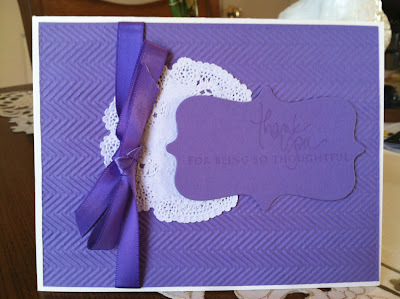 Today I am sharing one of my thank you cards that I made for Christmas. I made the same card in three different colors two of each. I really like how they came out. The picture is not great I so need a new camera!! I forgot how fun it is to use the embossing folders!! I plan to use more in my future cards! Well I am off to watch the rest of the Patriots game and finish making dinner. I hope everyone is well and has a great week! I will be back sooner than a month this time! Thanks for stopping by! Happy Saturday! I can not believe how fast the past few days have gone! I feeling like sometimes it just goes to fast! My sister and her family just left, I went and dropped a few things in the mail and now I am sitting down to read and relax. I love spending time with my sister and her family. It is sad we live so far apart and can only do it a few times a year. There are times in my life when I wish I lived closer to her and my Dad. Well maybe some day! We had a great Thanksgiving! Lots of eating,playing and talking. I have not had any craft time this week but sometimes I think family comes first! Here are a few pictures of my week and a tag too! I hope everyone has had a wonderful weekend! 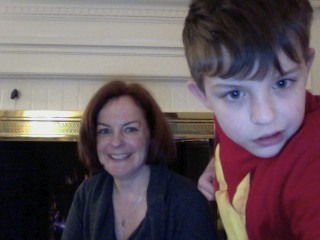 These are two pictures of me and my nephews that we took with my computer's iphoto booth. We took so many it was hard to pick. My older nephew was hard to keep still so this is the best I can show! 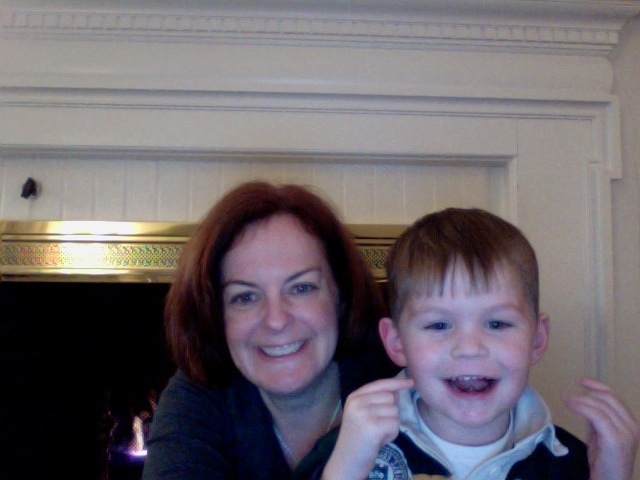 The four year old was easier to get a good picture with. This is one of my favorites! We made lots of silly faces!! Here is another tag! I love Papertrey's word dies! I hope they keep coming out with more. All products are Papertrey except the pearls. They came from my stash of stuff! Thanks for stopping by! More tomorrow! Happy Thanksgiving Eve!! I hope everyone has been having a wonderful week and you all are getting ready for the big day tomorrow! We have reservations at 12:30 so there is not lots to do here! Yay me! I am spending the week with family and friends! What a great time! This evening I had dinner with a friend from High School! We had a great time! Tomorrow my sister and family arrive! Today I am sharing another Christmas Card. 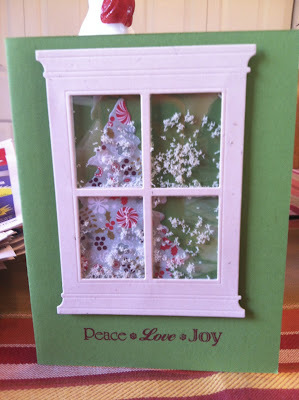 This card I made using the window dies Poppystamps Window die. I bought both the small and large one. I love how this came out! 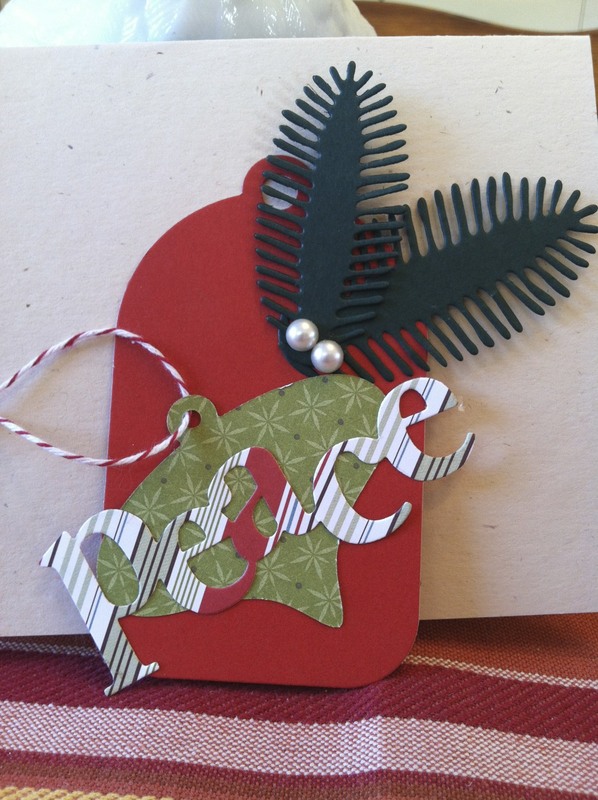 I used the Papertrey Tree die. I used a piece of plastic against the window and used flower soft for the snow. I then used pop dots to pop it off the page. This is a one of a kind. I think I will send it to a friend who does not read my blog. I think she will enjoy it! Well I am off! Have a great evening!! Greetings! Happy Tuesday! Today I am sharing one of the tags that I have made for gifts this year! I really love making these. I love that I can use any shape die for tags. 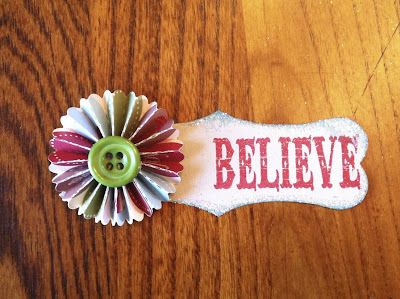 For this tag I used Paper Trey's Christmas Label Die, The Tim Holtz Flower thingy( yeah not the really name sorry! ), The button is Papertrey and the stamp set is Tim Holtz. I used glitter around the edges to make it pop. I like that I can make these fast and quick! Thanks for stopping by! Have a great day! I am someone who loves to craft and cook! I am hoping this blog will drive me to get into the craft room daily and participate more often in challenges. I will also share my love of food and life as well!